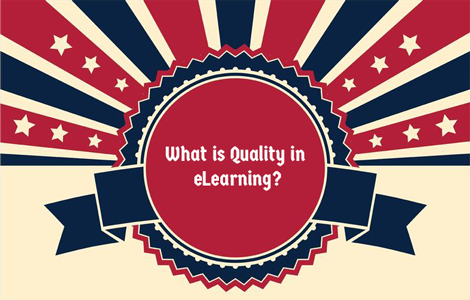 Quality Matters Part 1: What is Quality in eLearning? The fresh, ripe and round apples are the enchanting ones, often in great demand for the quality that the ‘tested’ label guarantees. Then money does not really matter! Product quality is important and is rapidly becoming an obsessive issue with everyone taking quality very seriously. Can an eLearning product be tagged as ‘quality tested’? Of course! There are standards and processes for testing educational and training products. The eLearning market is undoubtedly gaining popularity in every sector and is an outstandingly clear solution for learning in the workplace. In spite of the evident benefits, there is a great speculation about the technology-aided product in terms of effectiveness. The only way to lessen the incertitude is to provide adequate assurance of quality in eLearning that is precise, measurable and streamlined. Quality in eLearning cannot be restricted to a few typos, grammatical errors or spelling mistakes. It is a complex process which is more of a collective responsibility due to the different aspects involved in the whole process. This essentially means that quality should be tested at every stage of the eLearning process- from development to delivery and even afterwards. development process is a mandate. In spite of being the ultimate test of the produce, user feedback is an often overlooked component of quality. Regular surveys and visual feedback are the ultimate tools to gauge the effectiveness of a course. Knowing what works (and more importantly what doesn’t) means you can actively improve user experience, understand the potency of a course, stand out from the competition, and ensure customer satisfaction. A framework is necessary to provide a sequence of activities to follow in order to test quality into a product, that relies on a wide set of skills. Such a quality assurance procedure needs to be robust, convenient, clear and measurable (in certain ways), which can help maintain a condition of excellence, always!